Guest Lois Clark states, "Here lies Westport - far from the bustle, beckoning wayfarers to relax from the hustle, to stop and rest by the side of the sea, to listen to the waves - let your cares go free, savor the splendor of hills meeting sea; ponder their awesome constancy!" One of the warmest lodging facilities on the north coast is the Westport Inn. 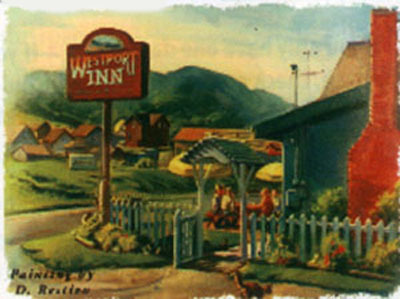 The main motel was built right after World War II in 1947, with the heart of the dining room built in 1895 during the boom town days of exploding Westport! Today tourists and residents sit and chat in the cozy dining room while enjoying delicious snack food and some of the best mochas on the Mendocino Coast. Otto Marsh uses delicious Italian Illy Cafe coffee. During the winter, guests can relax around the living room fire and on balmy summer days the outdoor patio with roses proves perfect. Guests marvel at the fragrant scent of the Sutter's Gold rose bushes. Original seacape art lines the walls. Paintings are for sale. The 6 comfortable rooms (from $75/2 + tax) provide tranquility and quiet except for the nearby roar of the Pacific and the wind whistling through the Westport trees. Guests from all over the world ply the coastline and end up here to enjoy the clean air, rolling pastures, pristine beaches and the warm ambiance of the Westport Inn.